Have you fallen for one of these 5 tooth-damaging dental myths? Most of us made our first visit to the dentist, and received our basic dental-health education, when we were no more than just a tot. If you close your eyes, you may even be able to remember how it felt. Sitting there in the big dentist’s chair, your little legs stuck out in front of you, as you listened to the dentist explain how important brushing and flossing is. Or you may recall staring at her wide eyed as you got the devastating news that you had to be careful to not let candy rot your teeth. Considering how young most of us were it’s really no surprise that so many folks have gaps in their knowledge. Or that some of us have fallen prey to some damaging dental-health misconceptions over the years. In other words, if you’ve been the victim of a dental-health myth you’re in good company. In fact, there are five persistent myths that I run into nearly every single day in my own practice. Have you fallen for any of them? A lot of folks firmly believe that flossing is optional. Or, more accurately, that daily flossing is just a pie-in-the-sky idea that dentists like to preach about. Nothing could be further from the truth, and believing this myth could cost you your teeth. If you’re applying the same principles you use to clean your home to clean your teeth, you could be doing terrible damage to your pearly whites. Tough tools and elbow grease are useful for scrubbing your floors, but using a hard-bristled toothbrush and a lot of force on your teeth can remove precious enamel. And that’s one thing you can’t get back. 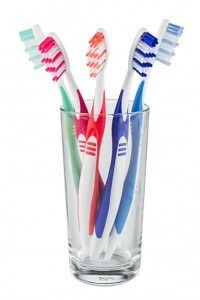 It’s best to use a soft-bristled brush (bristle strength is clearly marked on toothbrush packaging) and be gentle, yet thorough, when you do your 2-minute brushing routine in the morning and at night. As children, we often learn that candy is enemy #1 for teeth. Although it is true that candy and other sugary treats are no good for dental health, it’s dangerous to believe that they’re the only culprits. There are a whole bunch of other foods and drinks that can cause cavities and tooth decay. Visiting the dentist only when you have a toothache is a very good way to create serious dental problems that take a lot of time and money to fix. If you’re operating under the mistaken assumption that you just need dental care when something hurts, you’re sorely mistaken… pun intended. The fact is, many oral health issues don’t make themselves known until the problem is far advanced. You could be walking around with cavities and gum disease without knowing it if you haven’t seen a dentist for a while. You visit the dentist every 6 months to avoid letting minor issues become major ones. As they say, an ounce of prevention is worth a pound of cure. This common habit is certainly prevalent, but it’s definitely NOT harmless. Many people wake up with a sore jaw, or annoyed significant others who report that they grind away all night long. You might think it’s no big deal and that teeth grinding is something you (and your spouse) just have to live with. Both of those things are wrong. You can address your bruxism in a number of ways. Start by reducing stress, cutting down on alcohol and caffeine and making sure you’re relaxed at bedtime. It’s also a good idea to consult your dentist, who may recommend a custom-made night guard that will prevent you from grinding your teeth while you sleep. Don’t feel bad if you’ve fallen for one of these five common dental myths. A lot of folks have. But do resolve to change your habits starting today. After all you only get one set of adult teeth, it’s up to you to take care of them. Dr. Kimberly Dyoco is a general and cosmetic dentist in Chicago and the founder of One Mag Smile, a dental practice on the city’s famed Magnificent Mile. She is also an avid blogger who loves sharing her expertise and advice for preventative care with readers in a variety of online publications. For more, visit www.1MagSmile.com.